Multi-award winning musical The Book of Mormon continues to entertain West End audiences with its wildly outrageous humour! Originally opening on Broadway in 2011, the risqué musical has received rave reviews, as well as sweeping the 2011 Tony Awards. On its opening in London, The Book of Mormon was awarded several Olivier Awards, including Best New Musical and Best Theatre Choreographer for director Casey Nicholaw. Following two Mormon missionaries who are sent to spread the word of the Latter Day Saints in Uganda, The Book of Mormon pokes fun at both race and religion, leaving London audiences in stitches! 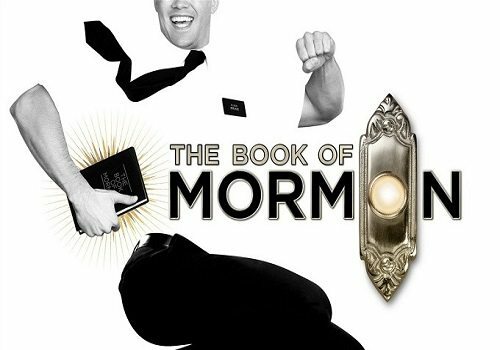 Written by South Park creators Trey Parker and Matt Stone, The Book of Mormon is a deliberately irreverent comedy with real themes of faith and friendship. The Prince of Wales Theatre box office is located within the foyer of the building and is open from open 10:00am - 8:00pm Monday to Saturday. Theatregoers can arrange for their tickets can be collected from the box office. Patrons may collect their tickets at any time on the day of performance so long as they have their booking reference to hand and the credit or debit card used to purchase the tickets. First built in 1884 by CJ Phipps and rebuilt in 1937, the Prince of Wales Theatre is one of the West End’s most prolific venues, situated just off Leicester Square. Opening with a revival of W.S. Gilbert’s The Palace of Truth, early productions included a variety of genres such as In Honour Bound, A Doll’s House, The School for Scandal and comic opera Dorothy, starring Marie Tempest. Further early shows included L’Enfant Prodigue (1891) and A Pierrot’s Life (1897), which both respectively introduced mime to British theatre. Additional notable shows included In Town (1892), A Tale of Two Cities (1899), Miss Hook of Holland (1907), King of Cadonia (1908), The Balkan Princess (1910) and Yes, Uncle! (1917). Throughout the First World War, the theatre continued to house shows and revues, including Ivor Novello’s The Rat (1924), Charlot’s Revue (1924), Voila! Les Dames (1935) and the building’s final production, Encore les Dames (1937). In 1937, the theatre was rebuilt in an Art Deco style, with a larger seating capacity. Shows including Les Folies de Paris et Londres (1938), Piccadilly Hayride (1946), Diamond Lil (1948), starring Mae West and several performances from The Beatles (1963) during the Royal Variety Performance. Later productions included Michael Crawford in Come Blow Your Horn (1962), Barbra Streisand in Funny Girl (1966), Sweet Charity (1967), Promises, Promises (1969) and The Threepenny Opera in 1972. A brief period of plays saw Bedroom Farce (1978) performed. After this, musicals were prominently on the bill, including South Pacific (1988-1989), Andrew Lloyd Webber’s Aspects of Love (1989-1992), Annie Get Your Gun (1992), Copacabana (1994-1996), Smokey Joe’s Café (1996-1998), West Side Story (1999), Rent (1999-2000), Fosse (2000-2001), The Witches of Eastwick (2001), The Full Monty (2002), the return of Rent (2002-2003) and Cliff – The Musical (2003). Following refurbishment under the management of Cameron Mackintosh, the Prince of Wales Theatre housed the transfer of ABBA musical Mamma Mia! (2004-2012), before it moved to the Novello Theatre. Beatles’ musical Let It Be played a short season from 2012-2013. Broadway musical The Book of Mormon has been playing at the theatre since 2013, and continues to entertain sold-out audiences weekly.